Alfred Norman (Alf) Hammond (1916 – 1967) was one of the great Cheshire Roaders. He joined the Club in April 1938 and it would take a ream of paper to mention all the highlights of his illustrious career in the ‘Chesh’. He started with a bang, winning a Club ’50’ in 1938 whilst still a prospective member, beating 28 other entrants. He won a Gold Medal for the Club in the Bath Road Club ‘100’. In 1939 he led our team to victory in the same event, and was himself third. After the war he began where he left off with several victories, high places in prestigious events and led our team to victories too numerous to mention. 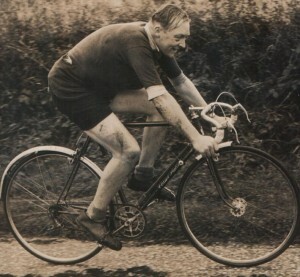 His best year was 1948, with 2nd in the Anfield ‘100’, 1st in the M&D TTA ’12hr’, fastest in the Abbotsford ‘100’, and capped a superb season by winning the National 12 Hour Championship promoted by the Manchester Wheelers on a very inclement day. He won by over 5 miles. The ‘Chesh’ also won the team award. He enjoyed all aspects of Club life with active participation in club runs and tours. He served on the committee in many offices. His services were duly recognised with election to Club President for 1958-60. Alf collapsed and died whilst riding home from work on the 2nd of February 1967. 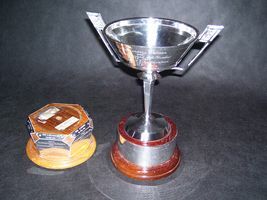 His wife, Enid, presented the Club with the trophy to be competed for in his memory. The trophy is awarded to the fastest ‘Chesh’ member in the Open ’50’. D A Wright was the first winner of the Alf Hammond Trophy. Another Dave Wright is the current holder and most prolific winner.